various olives in extra virgin olive oil, sea salt and spices. sliced coppacola, molinari salami and tasty ham served with sweet cherry peppers, marinated provolone, pecorino romano cheeses, olives and house baked herb bread. organic mixed lettuces with mini tomatoes, cucumber, red onions, shredded carrots and radish. your choice of balsamic, italian, blue cheese or ranch dressing. crispy iceberg lettuce with radish, toasted walnuts, red onions, shredded carrots, blue cheese dressing and parsley. a warm spinach salad with mushrooms, red onion, dried cranberries, feta, toasted almonds and zoes bacon in a balsamic vinaigrette. spicy, wicked irresistible chicken wings tossed in our own buffalo sauce, served with celery stalks, baby carrots and blue cheese dressing (or ranch upon request). Each Pizza Is Individually Hand Tossed To Order And Baked In A Traditional Brick Oven, Our Pizzas Take A Minimum Of 25-30 Minutes. tomato sauce, fresh basil & cheese. sausage, zoes pepperoni, garlic, mushroom, tomato sauce & cheese. zoes pepperoni, sausage, ham, molinari salami, red onion, tomato sauce & cheese. spinach, feta, mini tomatoes, red onion, olive, tomato sauce & cheese. artichoke hearts, tomatoes, green bell pepper, spinach, olives, mushrooms, tomato sauce & cheese. broccoli, mini tomatoes, garlic, tomato sauce & cheese. coppacola, pineapple, feta, tomato sauce & cheese. who ordered the double cheese and sausage? sausage, mushrooms, pesto, jalapeno, tomato sauce & cheese. pesto, roasted potatoes, feta and roasted red bell peppers. roast turkey with bacon, roasted red bell peppers, p rovolone, swiss and cheddar cheeses. The Pizza Place has the best pizza I have ever eaten and I've been eating there as often as possible for almost 40 years! You'll do well to eat here, you'll love it! Great location, Good food, Simple enough! Had a thick slice of Pepperoni and a pizza roll (to go). Quick and easy. Will return! Literally thought okay I can get through these pieces of pizza. I did the best I could. They are thick deep dish baked twice slices and a local favorite and being from Wyoming I had to try it and I’m glad I did. Got pizza and pepperoni rolls!! Both were absolutely fresh and delicious! Highly recommend for your pizza experience!!! We got a large thick crust pepperoni pizza and boy was it big and delicious. We ate about half and took the rest home. The crust was amazing!!! Definitely will be eating here again!!! Stop over visit in the area and wanted pizza. The front desk where we were staying recommended it and it was absolutely delicious!!! 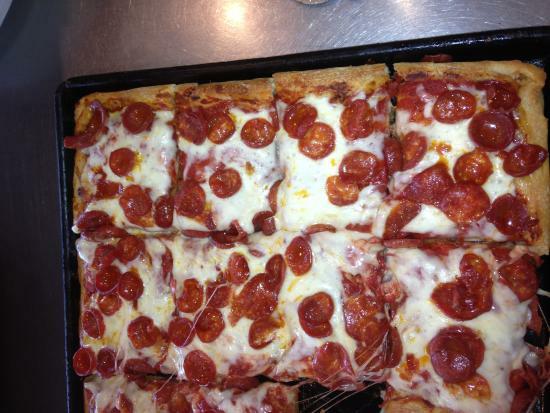 I’ve traveled the world and I travel to Parkersburg to get the best pizza in the world. It’s really the best pizza I’ve ever had! Get quick answers from The Pizza Place staff and past visitors.